Genuine Mopar performance parts are used to build every single crate engine we have in stock. Our engine mechanics work very hard to make sure that Chrysler power is not reduced or altered in any way, shape or form during the building process. 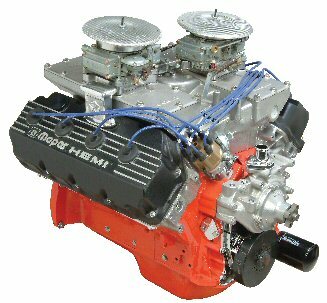 We have top of the line Mopar crate engines for sale at prices you won’t believe. Why settle for a remanufactured engine when you can have a crate engine for less? All parts that are put onto our crate engines are checked for accuracy and performance or we don’t use them. When you buy one of our Chrysler crate engines, you are getting the absolute best we can offer. We know two engine builders can use the exact same parts and come up with two totally different engines in terms of performance. The secret to our success is in the education and training of our expert mechanics. They know Chrysler very well. All of our mechanics that take part in our crate building process are trained to build any type of Plymouth, Dodge or Chrysler crate engine. There are no mistakes made and every part is hand applied to make sure that there are no leaks or other issues that can happen with careless installations. The knowledge that our mechanics have is absolutely priceless when it comes to building high quality crate engines. All the work that we do when building Mopar crate engines comes with a warranty. It is useless to buy an engine without some type of warranty protection although some people do it. We want to showcase the quality of our engines and we make sure that they work better than expected. No part can last forever and could fail due to manufacturing or other issues beyond our control. If you happen to experience a problem, we warranty the parts that we use and will fix any problem fast. We don’t want you to go without an engine when it has our name on it. We take care of our customers and choose to provide only the best engines that we can for the lowest prices possible. The 5.7L Hemi, 6.1L, and 6.4L Hemi’s are included in our crate engines inventory. We know that not everyone wants the fastest engines known to man. It does not matter if you are building project cars or just replacing an engine. We make sure that what you get is top quality or we refuse to sell it to you. We ship our engines around the world and our goal is to satisfy every one of our customers. We are the go-to resource online for Mopar crate engines. We won’t hassle you or sell you something you don’t want. You can choose to get your price quote by email when you complete our engine quote form. We make it fast and super easy to get our low price for Mopar crate engines and ship your engine super fast.